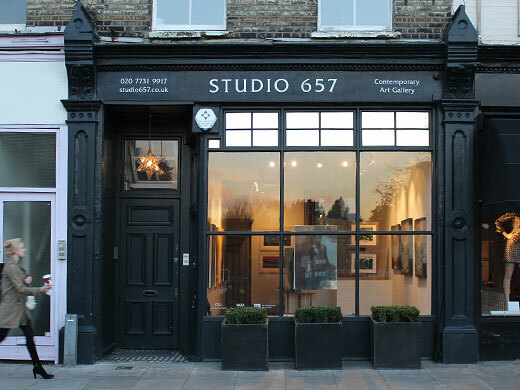 Studio 657 is a stunning exhibition gallery situated on the Fulham Road a few minutes walk from Fulham Broadway and Parsons Green tube stations. It is an excellent central location surrounded by vibrant restaurants, cafes and designer shops and the Kings Road a short walk away. 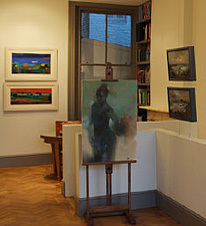 In January 2012 the gallery was completely refurbished and modernised to a high standard. 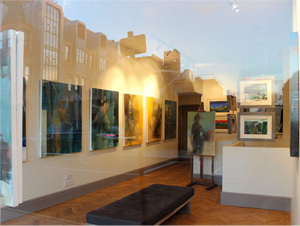 The gallery consists of a large window facing directly onto the busy Fulham Road in which there is a wire hanging system and excellent directional lighting which maximises the impact of the window display at night. The Gallery has a high ceiling and the main room benefits from good natural day light with state of the art directional lighting when necessary. The floor is reclaimed oak parquet, creating a good ambient feel and there is a spacious cloakroom accessed via a small library and a storage cupboard on the same floor. A kitchen and preparation area is to the rear of the gallery, equipped with a sink, fridge, dishwasher, hobs and oven. A ladder and coat rail with hangers are made available for use, as well as a kettle and glasses for private viewings. Both the gallery area and the kitchen have power points. The gallery has a burglar alarm and insurance but your works will need to have your own separate insurance and the gallery cannot take any responsibility for loss or damage. Studio 657 is perfect for displaying both contemporary and traditional works of art.